It’s not since 2005 that a team from the CYCA have won the HARKEN International, they got close last year with Harry being narrowly beaten by The Royal Prince Alfred Yacht Club’s, Milly Bennett in the final the race. “It feels great! After the loss to Milly last year I wanted to step it up this year. The boys put in a really good effort and I’m really happy with it.” said Harry. “It was all over the place today with some good wins and a few losses but we were able to get it together for the final” Harry added. The win didn’t come easy for Harry with his opponent, George Anyon from The Royal New Zealand Yacht Squadron (RNZYS) and his team who gave it their all during the finals making it a classic ANZAC battle. In the finals George showed everyone that he wasn’t just the “Round Robin King” (known by his peers for his ability to do well in the round robin and struggle in the finals.) He sailed extremely well matching up to Harry and was very happy with the result. “ I’m really happy, at the end he just came at us and a few small mistakes cost us, we were fast and we came really close at times but it was definitely some of the best match racing I’ve ever done.” said George. 3rd place went to RPAYC’s Will Dargaville and his team who raced very well with 13 wins and 2 losses in the round robins but unfortunately had a few to many errors and missed wind shifts during the semi finals against George and couldn’t progress into the finals but just held on to defeat Lachy Gilmour from Royal Freshwater Bay Yacht Club (Perth) in the petit final so secure 3rd place. The event tested all competitors with scorching heat, cold southerlies and windless summer afternoons. With racing being delayed during Friday’s heatwave, Race Officials managed to roll out 60 plus races on Saturday and to accommodate a record number of 16 teams in a youth match racing championship over 130 races were conducted over 4 days of competition. “All the Race Officials and Umpires just kept things going on Saturday it was like clockwork, the wind stayed steady and they (Race Management) just rolled out race after race.” said Katie Spithill, event co-ordinator. 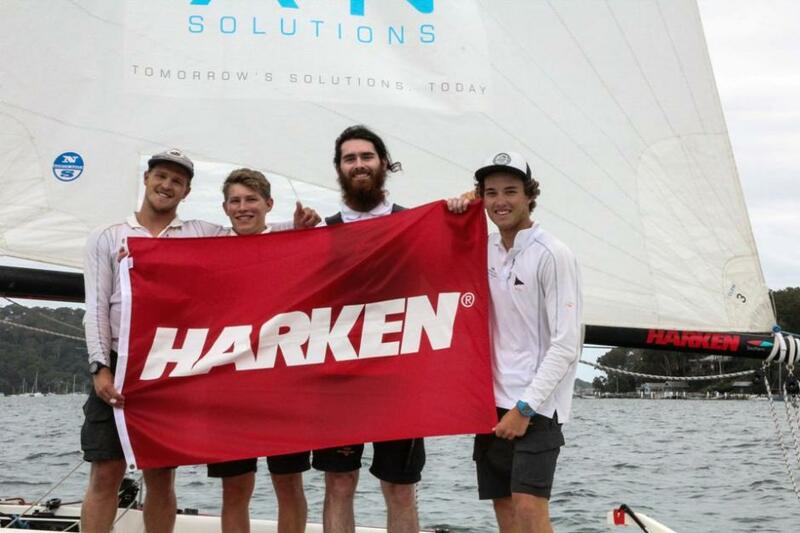 Harry and his team not only get their name on the HARKEN Trophy but also have a unique opportunity to go out for a training day on 33 South Racing Team’s Extreme 40 High Performance Racing Catamaran on Sydney Harbour. 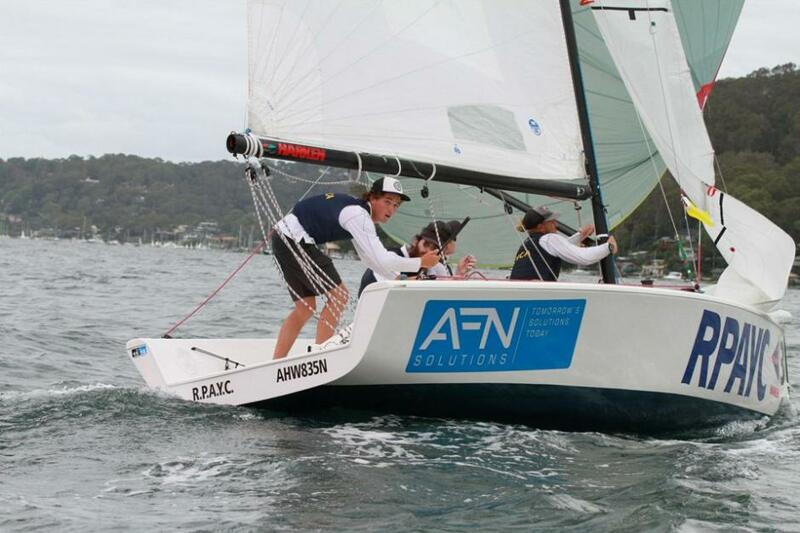 The 23rd annual HARKEN International Youth Match Racing Championships, hosted by The Royal Prince Alfred Yacht Club welcomes the continuing support of HARKEN Australia as its naming rights sponsor. 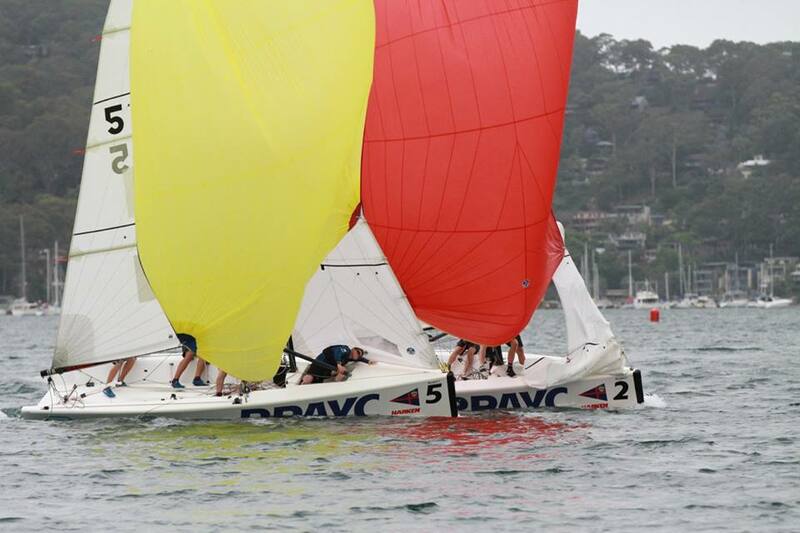 This year, the RPAYC will be showcasing its fleet of Elliot 7s for this premier event held on the magnificent waters of Pittwater. Teams compete for the Rockin' Robin Perpetual Trophy on the RPAYC's Elliot 7 performance keelboats with a crew of four or five, all of whom must be under 23 years of age. After 50 plus races during day 3 of the HARKEN International Match Racing Championship, The Royal Prince Alfred Yacht Club’s Will Dargaville is the winner of the round robins. With weather being much cooler than the fan forced 39 degrees on day two, Race Management took full advantage of the 15 – 20 knot southerly to squeeze in as many flights as possible after postponing the racing the day before due to the heat. For Will, there was no time for bird watching, he and his team of Harry Hall, Sarah Parker, James Farquharson and Rachael bower were switched on to achieve 13 wins and 2 losses with a close win to last year’s runner up, Harry Price in final of the afternoon’s races to seal the overall win. One of Will’s losses was to fellow club teammate, Clare Costanzo, Clare managed to stay in the boat today to cause a few upsets. “It was pretty good today, pretty satisfying. We race him (Will) all the time and it was great to beat him, we had a very even race until the last downwind leg where we just got the win.” said a very happy Clare. Last year’s winners, Milly Bennett and her MAXX Team weren’t strong enough to progress to the top four semi finals finishing 9th. “It’s pretty devastating, we had too many little errors that cost us, it’s good that we (RPAYC) have a team in the finals though.” said Milly. With a few changes to the to the race schedule due to the number of teams and time restrictions, Race Management decided to not race the quarter finals and head right into the semi finals. The semi finalists are as follows and the winner will be determined from these top four. As for the bottom 8 teams their racing is now over. 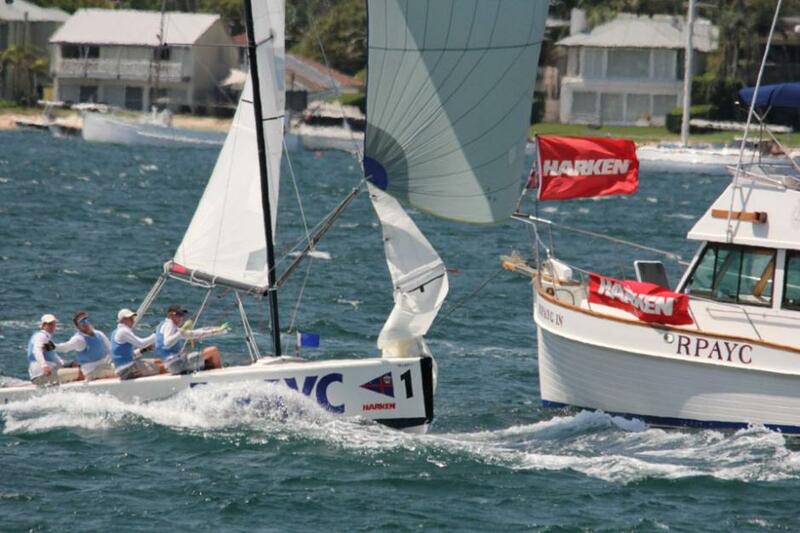 HARKEN International veteran, Jayden Stevens, sailing in his record 8th Championship from the Canberra Yacht Club team aren’t heading to the finals but still enjoyed their racing. “It was the first time some of us jumped on yachts so it’s pretty big stuff coming from little Canberra.” Jayden added. Teams compete for the Rockin' Robin Perpetual Trophy on the RPAYC's Elliot 7 performance keelboats with a crew of four or five, all of who must be under 23 years of age. * Robyn Wiltshire presented the club with a perpetual trophy named the ‘Rockin’-Robin Trophy’. Robyn presented the trophy in memory of her husband Grant and son Robert, Andrew Young & Jeff Smith, all club members who tragically lost their lives at sea aboard the yacht ‘Rockin’ Robin’ whilst on passage to Fiji in 1990. 38 plus degree heat coupled with 20 plus knots of Westerly during the afternoon’s races tested the competitors to their limits in the second day of the HARKEN International Youth Match Racing Championship. At the start of the day the wind swung from the North to Northeast back to East till eventually it settled on staying Northwest at about lunchtime which brought in the heat! The teams took on the conditions and even with regular stops to the mother ship for water and supplies it was a little too much for some. Race management decided to postpone the racing after a couple of competitors suffered from suspected head stoke. “It was just too hot, we had some competitors suffer from a few minor injuries and suspected heat stroke so it was the smart thing to do” said Katie Spithill, event coordinator. Everyone described the day to be “like a fan forced oven” with Will Boulden (Royal Freshwater Bay Yacht Club) from Perth claiming it’s one of the hottest conditions he’s ever raced in. “It was like a fan forced over out there, hot and windy, back home in Perth it’s hot but usually not as windy but here it was just like we were cooking.” said Will. “Racing wise though we had one bad loss and two good wins, it was good to get out on the water.” Will added. 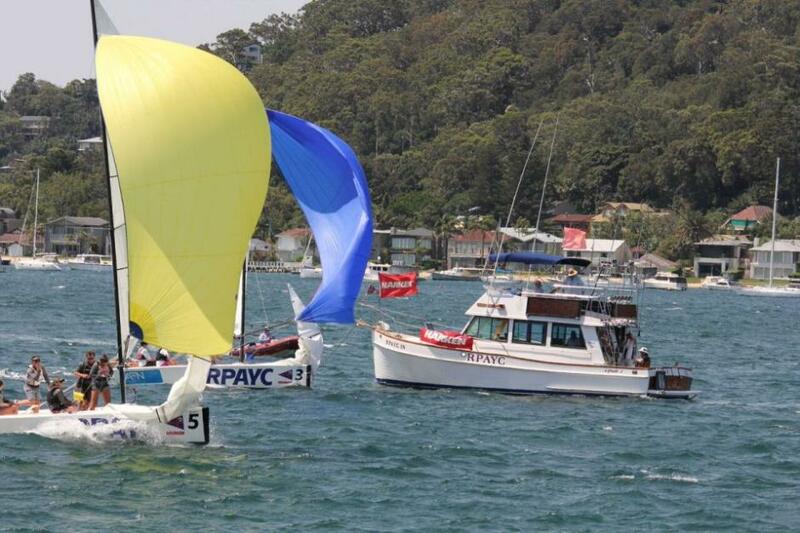 Pittwater sailor, Clare Costanzo (RPAYC) had a hard time just staying in the boat after a specular person overboard stunt. It wasn’t all bad for Clare, she soldiered on and claimed two wins before coming in to nurse her bruises. To everyone’s relief tomorrow’s racing is predicted in much cooler with the Bureau saying it will be 23 degrees with a 15-knot southerly. 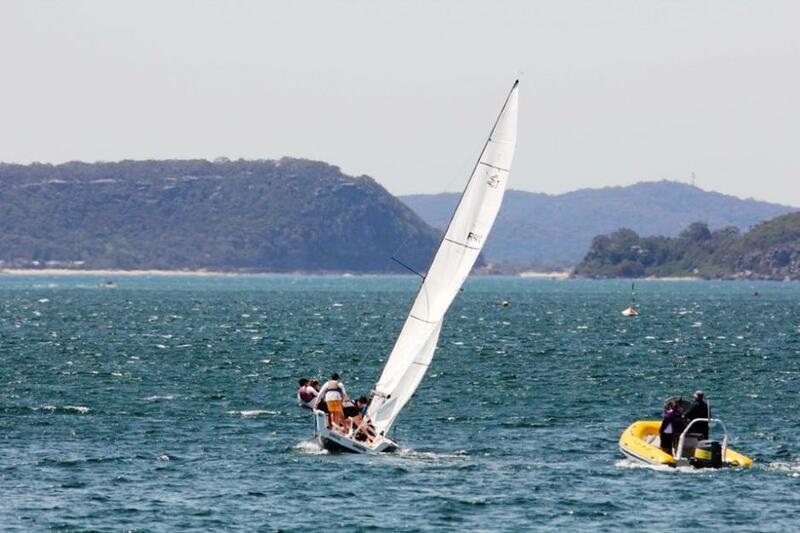 Sunny skies, steady sea breezes welcomed the record 16 teams for the start of the 2015 HARKEN International Youth Match Racing Championship on Pittwater. With some tunes flowing and games of UNO, the teams looked very relaxed whilst they killed timed between races. After an impressive 40 plus races, New Zealand’s George Anyon (Royal New Zealand Yacht Squadron) and host club’s Will Dargaville (The Royal Prince Alfred Yacht Club) came out on top with an undefeated day. “I’m the Round Robin King because I do really well in the round robins but never seem to win the regatta, pretty much the same thing that happened to be last year but I’m just going to have to come out racing during the knock outs to do one better this year.” Said George. Will Dargaville, Pittwater local, was pleased his team did well in some tough races throughout the day. “We had some tough races and it’s only going to get harder from here.” said Will. The day’s racing also featured some major upsets with Zoe Bennett from New Zealand (Royal Port Nicholson Yacht Club) who is one of the youngest competitors racing in her first match racing regatta, defeated 2014 HARKEN International Champion, Milly Bennett (no relation by the way) giving Milly one loss for the day. “We had a few errors and she (Zoe) just crept up on us near the finish, full credit to her though she sailed really well, she was always on our tail.” said Milly. The wind eventually died and gave Pittwater a nice glassy finish, great for photographers but not so much sailors. Teams headed home after more than nine hours on the water. The forecast for tomorrow is predicting for one of the hottest days this year with 40 plus degree heat.